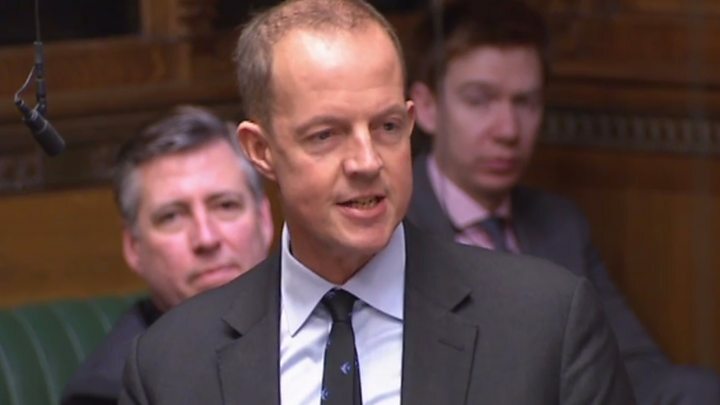 Former Conservative MP Nick Boles has accused the cabinet of being "cowardly and selfish" for failing to challenge Theresa May's approach to Brexit. Mr Boles, who quit the parliamentary party on Monday, said the PM had "misunderstood and mismanaged" the whole process of leaving the EU. And he told the BBC's Laura Kuenssberg no-one in the cabinet "had earned the right" to succeed her.The Tory Party "did not really exist any more", he also suggested.Mr Boles was part of a cross-party group of MPs co-ordinating efforts to find a compromise in Parliament around a Brexit proposal that would retain access to the single market. After his Common Market 2.0 plan was rejected by MPs for the second time on Monday, he accused his party of "failing to compromise".He said he could no longer represent them in the Commons and would sit as an independent. Nick Boles: "I have failed, chiefly, because my party refuses to compromise"
Mr Boles, the MP for Grantham and Stamford, told the BBC his former party was gripped by a combination of "cowardice and dogma".He said the prime minister had been totally preoccupied with the wishes of her party and had never attempted to "construct or understand what a deal would look like to bring the country together".Senior ministers had shown a "collective failure to lead and unite" and had "all put their interests first". "There are fine people in cabinet but this is the worst cabinet in recorded history," he said. "None has earned the right to lead the country after Brexit. "He suggested Brexit would be the equivalent of a "meteor strike" on the British political system and none of the major parties would be immune from the repercussions. But he also admitted that MPs who wanted closer economic links with the EU had failed to coalesce early enough around an alternative to the PM's deal and had "missed the boat".The MP quit his local constituency party last month amid a campaign by some party members to deselect him as their candidate for the next election.